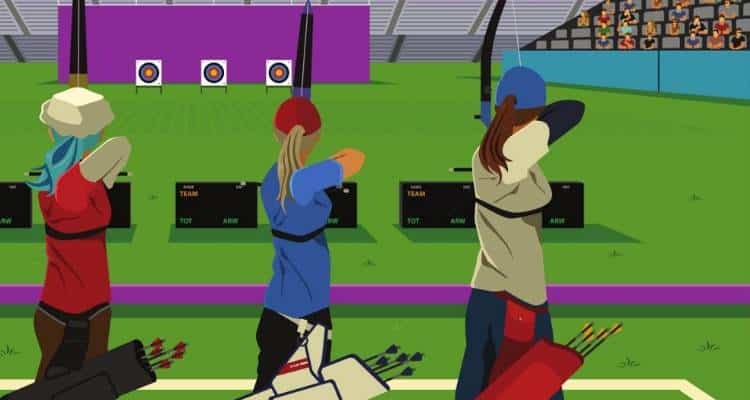 The World Championships to the Olympics are the most important and well recognised of all archery competitions, but do you know all the rules, shooting distances and the different divisons? This article wil fill you in on everything you need to know from Olympic recurve to World 3D. The following competition names, distances and divisions have been assembled from the rulebooks of World Archery and the International Olympic Committee. As you can see 70m is the furthest target distance expected for any shot in a world or olympic championship round. Archery was first introduced to the Olympics in 1900 and was part of the 1904, 1908 and 1920 lineup but was not included again until 1972 but its been there ever since! Olympic archery is restricted to the recurve bow and both men and women shoot at a target 70 meters away. The target is 122 cm in diameter with a gold or bullseye measuring just 12.2 cm in diameter. Although the center of the target is yellow you’ll hear it referred to as ‘Gold’​ and there is an inner gold ring worth 10 points and an outer gold ring worth only 9. The gold has 2 inner rings both worth 10 points, the smaller inner ring is used to differentiate in a tie-break situation. ​Top Olympic male archers can typically draw around 45-55 pounds and female archers 40-48 pounds. Olympic archery is contested over a ranking phase, a knockout phase and the finals. This can all take place over a week or more depending on weather conditions and scheduling. There are divisions for individual men, individual women and team men and team women. We’re going into detail on the 3 phases of the individual competition here. ​Individual men and women title contestants shoot 72 arrows, 6 at a time to achieve a ranking score. The ranking score is used to determine which athletes can recieve a ‘bye’ or skip the first round of knockouts and automatically advance (usually the top 8) and which are eliminated from the competition (usually only 64 advance to round 2). A perfect score in the ranking round would be 720 (72×10). Kim Woo-Jun (Male, South Korea) scored 700 at the 2016 Rio Olympics on 05/08/2016. That’s a lot of gold. Once ranked athletes enter a knockout stage where they are pitted against one another in a match scored using a 5 set system. This round pits the best ranked archer against the worst ranked, for example (as in Rio 2016) in a set of 64 people in the knockout round the archer ranked 1 will plays the archer ranked 64, and the archer ranked 2 plays the archer ranked 63 and so on. Once this first round of knockouts is completed only 32 archers will remain. The process is repeated through 2 more knockout rounds until only 8 archers remain and they advance to the Quarters, Semis and Finals. Each set consists of shooting 3 arrows and the competitor with the highest combined score gets 2 points, a tie results in one 1 point. First to 6 points wins the match. Dan now has 6 points and wins the match! A tie in a match results in a single arrow shoot-off, the closest arrow to the middle of the target wins.​ This is where the center ring on the target comes into play. There will likely be a break in proceedings at this point as only the final 8 competitors remain and the final 3 rounds called the quarterfinals, semifinals and finals using a similar elimination method decide the champion. These matches are contested using the same 5 set rules as the previous elimination rounds, albeit with slightly more pressure and circumstance! Also contested are team events made up of either 3 men or 3 women again shooting 72 arrows to define a ranking position. The teams then face off against each other in a match consisting of four sets of 6 arrows (two per archer), and the team with the highest score from the total of all six arrows receives 2 set points, a tie results in 1 point. The first team to 5 set points wins the match. Read more at the World Archery Federation website https://worldarchery.org. The Paralympic division of archery was part of the first Paralympic games in Rome in 1960 and has been part of the programme ever since. The divisions consist of Open and W1 classifications, both classifications may include athletes with impaired legs who shoot from a wheelchair. Open athletes must use a bow under standard rules however W1 athletes may have bows modified from standard rules. ​Paralympic archery is shot using the same scoring rules as olympic archery for both the compound and recurve bow. Every 2 years the World Archery Federation hosts the World Archery Championships. The ‘world archery championships’ actually refers to the outdoor target variant of the world championships and the winners are known as the “World Champions” as outdoor target archery is seen by most as the blue ribbon event. ​The recurve championships division uses the same rules and distances as the Olympics. ​Recurve contests are similar to the Olympic rules above with a seeding round, then a knockout match of the same format. ​The world compound division is shot over 50m at an 80cm target with an 8cm diameter inner gold ring. ​Compound contests are decided using cumulative scoring, 15 arrows in 5 ends of 3, the highest 15 arrow overall score wins the match. A tie results in a single arrow shoot-off, the closest arrow to the middle of the target wins. Indoor archery is shot at a target of 40cm in diameter ad at a distance of 18m (20 yards). The recurve division has a 4cm diameter gold and the compound division has the same size target but with an additional 2cm inner gold ring. In international competition there are 3 targets aligned vertically and one arrow is shot at each target. This competition is shot over 60 arrows and 12 ends, 5 arrows per end. In the the world youth archery championships you’ll find the same rules and target sizes as the world adult championships except there are 3 divisions, a junior recurve division over 70m, a cadet recurve shot over 60m and a compound division shot over 50m. Paralympic archery championships are similar in division and rules to the paralympics with the exception of the addition of the V1, V2/3 categories to account for athletes with visual impairments who may be assisted verbally. The world field archery championships have 3 bow categories, barebow (recurve with no aids), recurve and compound. Field archery competitions are shot over 2 days at a maximum of 48 targets. One day consisting of 24 targets with marked distances and another consisting of 24 targets of unmarked distance. Compound and recurve bows shoot the targets from the farthest distance (marked by a peg) and barebows shoot from a closer marked peg. After this round the top 16 scorers for each bow type are moved to an elimination round where they shoot 3 arrows at 12 marked targets. From this round the top 8 are advanced to a second elimination round there they shoot 3 arrows at 8 targets. From this round the top four advance to the semifinals and final is decided. These final rounds are shot at 4 marked targets with 3 arrows per target. 3 dimensional archery (3D) is similar to field archery except the target is a 3D (usually foam) representation of an animal (deer, bear, leapoard etc) with a target area marked on the side. 3D archery targets may be distance marked or unmarked depending on the style of the tournament. A typical round is 40 targets and an archer is only allowed 1 shot. The marked area on the target is divided into different scoring rings and the highest cumulative archers score at the end of the round determines the winner. Championship rounds consist of 2 qualification rounds followed by 2 elimination rounds and a final round. There are 3 or 4 courses of 24 targets each for the qualification rounds and three courses of 12 targets for each first elimination round. The qualification and elimination rounds switch courses after each round so they never shoot the same course. The final round is a course with eight targets. what is the longest distance of a 3d target ?…thanks !